This month a new generation of Jewish students will begin their first term at University. Here’s my advice to them. You’re off to university. First time away from home. First time away from your synagogue community. Or perhaps you’ve had a year out after school and have been in Israel soaking up your Jewish heritage. Maybe you’ve been on a Jewish leadership trip organised by your youth movement or a Birthright tour. But now it’s back to reality and you’re about to discover what it means to have your ideas challenged, your prejudices pointed out and your Jewish identity undermined. But don’t worry. This is all to the good. It’s exactly what you need. Trust me, I was once a first-year Jewish university student too. You may realise this already, but the baggage you’re taking with you to university is considerably more than what’s in your rucksack. It’s been accumulating throughout your life, it’s the stuff that’s made you who you are. Now you have the opportunity to unpack it, examine it, and decide if it’s still useful for the journey ahead. 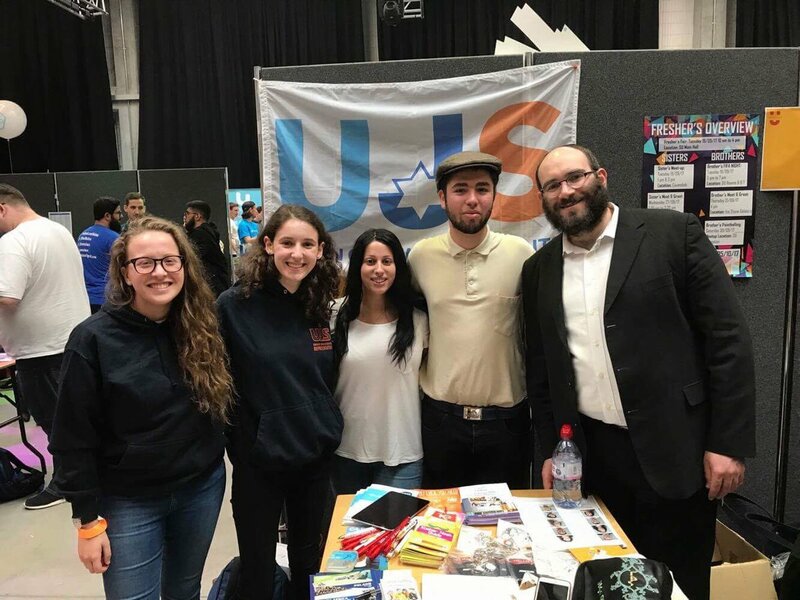 Union of Jewish Students’ stall in Freshers’ week, Manchester Metropolitan University. Any UJS group is likely to support ‘the 2-state solution’ while doing nothing to bring it about. I’m talking about that sense of being Jewish, the way you relate to your family history, the Jewish community where you grew up, what you think about Israel. In short, your Jewish identity. In an age where identity politics have become so central to our culture your Jewish identity has become almost sacrosanct, untouchable, beyond criticism. But is that how it should be? I’ll come back to this at the end. I realise my credentials for offering advice about Jewish university life are now pretty thin. It was 1985 when my parents drove me from our home in Bromley, South London, to Manchester University in the north of England, then the institution of choice for a large slice of young Jews who’d grown up in the capital. Before I pass on the little wisdom I’ve accumulated, let me provide some personal history and reflect on an event that set me on a path to Palestinian solidarity and Zionist dissent. Before starting at Manchester I had just come back from a long trip to Israel, my first, and I was already struggling with what the Jewish State meant to me. I didn’t have the words to articulate it at the time but something about my experience in Israel had left me confused and ill at ease. I’d spent time on both religious and secular kibbutzim and at a project in the northern Galilee town of Safed that aimed to inspire young diaspora Jews to become modern orthodox in their religious practice and firmly Zionist in their politics. While I could relate easily to the Jews of my age I’d met from America, South Africa and Europe, I found Israelis themselves difficult to get along with. As for the idea that I had somehow returned to my ancestral home – that feeling never kicked in. It turned out to be easier to take the boy out of Bromley than Bromley out of the boy. Back home in the UK, two of my new flat mates in our student hall of residence had no such angst, no such dilemmas. Phil and Andy had returned from Jewish leadership programmes in Israel ready to take up positions in the student union and advocate on behalf of Israel whenever the need was required. I recall being slightly in awe of their self-confidence and their self-belief as leaders and as advocates. It would be a long time before I found my own voice on the issue of Jews, Judaism and Israel. During my first two years I went along to the Wednesday lunchtime political debates in the recently re-named ‘Steve Biko’ student union building. And when Israel came up I voted the way the Jewish Society (J-Soc) advised. Phil and Andy were good at their job. 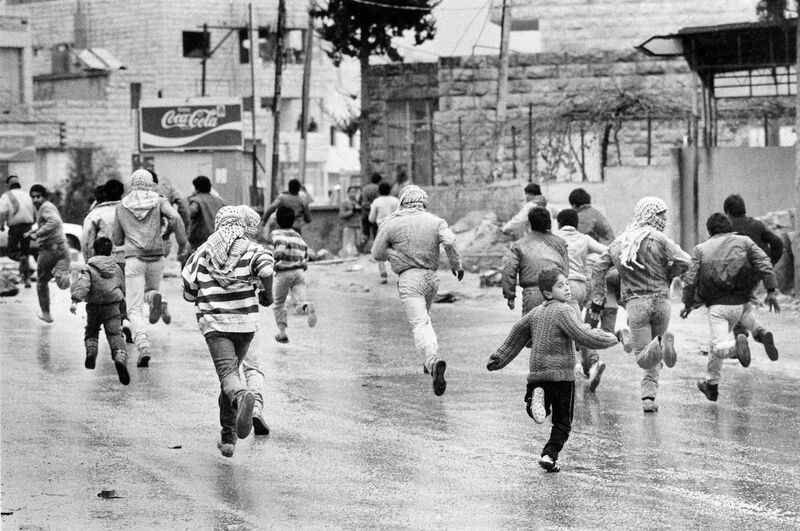 Children run from Israeli soldiers, 1st Intifada. Photo by Coutausse. Then in my final year at Manchester (exactly thirty years ago) my understanding of Israel began to take a decisive turn. With my exams approaching I should have been getting down to some academic work. John Locke, Jean-Jacques Rousseau, J.S. Mill and Karl Marx were all demanding my serious attention. But instead I was using the university library to follow, and attempt to fathom, the outbreak of the first Palestinian Intifada. The uprising that began in Gaza in December 1987 quickly spread to the West Bank. It was an uprising from the streets of occupied Palestine provoked by frustration and disillusionment and it was characterised by strikes. boycotts, civil disobedience and, most notably, children and young people throwing stones at armed Israeli soldiers. The Israeli response from on high (Yitzhak Rabin, then Defence Minister) was to “break their bones”. The first Intifada was a modern day re-working of David and Goliath from the bible. In fact the tale of the future Jewish king slaying the Philistine giant with just a sling and a stone was my favourite bible story, the one I’d ask my father to read to me again and again. Maybe that’s why this stone throwing rebellion caught my imagination in the first place. But this time the Palestinian children were David and the Jewish soldiers were Goliath. It was an unsettling role reversal. After all, surely we had ‘written the book’ on what it meant to be the victims of oppressive power? How could this be happening? You have to remember that in 1987 the internet, Facebook, Twitter and even email were still a long way off. To find out what was going on in Israel and the Occupied Territories I based myself in the first floor periodicals section of the John Rylands Student Library when I should have been one floor up in Politics & Philosophy. On the shelves of the periodicals section there were current and back copies of the Guardian Weekly and the New York Review of Books, Commentary magazine and Foreign Affairs. I read articles by Americans and Israelis from the left and the right and in particular was hooked by the words of David Grossman and Amos Oz the two most well known Israeli liberal Zionists and opponents of the Israeli Occupation. Until the first intifada I had little sense of the Palestinians as a community with a heritage and history as close to them as mine was to me. Now they were no longer just terrorists pursuing a militant cause I didn’t fully understand. My sense of unease about Israel that had begun during my first visit to the country was beginning to find its articulation. Here was a people suffering in the West Bank and Gaza because of what my people were doing. Maybe if I’d walked up to the next floor Locke, Rousseau, Mill and Marx could have shed some light on the reasons for the Intifada too. Rights, liberty, freedom. Hadn’t I spent three years studying these things? The first Intifada was for me the start of a long journey of reading, reflection and finally encounters and conversations with Palestinians that’s taken me to the place where I now stand. So what’s changed between my leaving university and your arriving? Well, for a while, the Palestinians were allowed to become a people rather than merely the creators of terror. But the ‘peace process’ that emerged directly from the first Intifada didn’t last long. Israel’s idea of Palestinian autonomy turned out to fall well short of rights, liberty and freedom. And all the time the Settlements expanded, the Jewish only roads grew longer and the checkpoints multiplied. The occupier continued to occupy. Closer to home the Jewish leadership in the UK, including the Union of Jewish Students (UJS), adopted the two-state solution but then spent 25 years doing nothing to help bring it about. There was never any serious public pressure on Israel from the Jewish community in Britain and never any attempt to prepare Jews here for the obvious compromises involved in making a Palestinian state, worthy of the name, a reality. Instead, our leaders, both religious and communal, did Israel’s bidding which became ever more right wing and intransigent as the years went by. When you get to your university you’ll see that UJS is keen to talk up its commitment to “peace” and “two-states for two peoples”. Through its campaign for “Bridges not Boycotts” it hopes to show itself as a liberal, compassionate defender of free speech. But in practice UJS behaves just like its elders in our Jewish leadership. It pursues tactics that define and constrict the parameters of acceptable student debate on Israel/Palestine; it dictates what antisemitism looks like; and attempts to ‘own’ the definition of modern Jewish identity by locking it into Zionism. As for discussing one secular democratic state or some kind of federal constitution, no way folks. That’s all off limits. Because ultimately such thinking calls into question the privileged discrimination enjoyed by Jews in Israel, East Jerusalem and the West Bank and indeed for you and me as Jews with the ‘Right of Return’. By parroting “two-states” UJS kicks every moral consideration down the road and into the long grass. Why worry about today’s land and water theft? Why be concerned about the pauperisation of Palestinian farmers? Or arrests without charge. Or children in prisons. All will be resolved when the moon and the stars are finally aligned and the requirements of Jewish security are satisfied beyond all possible doubt. So that means sometime never. The truth is that the longer we cling to the fiction of two-states and the belief that Zionism is not merely an ideology but a part of our faith and identity, the longer it will take to bring anything approaching peace with justice to the land. Making the call for “two-states”, when it’s become clear it will never happen, becomes no more than an excuse for ethical passivity. It allows you to wrap yourself in a banner with with the words “peace/shalom” painted across it and feel secure in your denial of Jewish culpability in the on-going destruction of the Palestinian people. I know this is tough to hear for young Jews when you’ve been schooled on the innate goodness of all things Israeli. But now is the moment to confront the reality of the Jewish relationship with the Palestinian people – our defining Jewish relationship for the last 70 years. Don’t confuse “peace” and “two-states” for justice and equal rights. Don’t mistake Jewish nationalism for Jewish self-determination. Don’t wait for the Chief Rabbi or the Board of Deputies to ever say anything remotely ethical about the treatment of Palestinians by Israel. Don’t wait for Trump, or May, or Macron or Trudeau to say or do anything useful about this. Don’t wait for another massacre in Gaza. And don’t take as long as I did to work things out. Instead, take the opportunity of being away from home to hear other voices and other opinions. Allow yourself to listen with an open mind and an open heart to Palestinian experiences. Check out the history of 1948 especially the last thirty years of Israeli academic writing including the expulsion of the Palestinians from Safed which nobody mentioned while I was living there. And don’t allow people to tell you you should feel scared or vulnerable if other students talk about boycotts and sanctions against Israel. If you took modern history at school you should be able to work out the difference between Nazi boycotts of Jewish shops in the 1930s and a campaign for human rights in 2017. And if you hear things said that make you upset or confused or angry that doesn’t make it antisemitism. Jewish identity has never been static and has always been questioned and challenged by Jews themselves in every age and every place where we have lived. Zionism itself is an example of just that tradition of challenging our own understanding of who we are and what our future should be. You have the same right to challenge today’s received wisdom; to ask the difficult questions; and create a way to be proud of being Jewish that isn’t trapped in an ideology that’s long passed its sell-by date. So be bold, be courageous and decide where you want to stand and who you want to stand with. What happens to your sacrosanct understanding of ‘being Jewish’ when it becomes another people’s catastrophe? Thanks for taking the time to read this. Have a great first term. August 15, 2017 —Historian Ilan Pappe’s new book The Biggest Prison on Earth: A History of the Occupied Territories continues his work of shining new analytical light on the seemingly intractable Israel-Palestine conflict, following up earlier books such as “Ten Myths About Israel” and the bestselling “The Ethnic Cleansing of Palestine.” Pappe recently talked with Monitor contributor Steve Donoghue about his work. Q: Your new book is already sparking the kind of controversy that greeted “The Ethnic Cleansing of Palestine” and “Ten Myths About Israel” – this must be a familiar pattern to you by now, yes? Do you find that the tenor of this conversation has changed at all over the years? Is there more receptivity to your work, for instance? It depends where. Around the world, yes, the tenor has changed. There is more readiness to change the language that describes Israeli actions in the past and the present; there is less disbelief when a systematic abuse or dispossession is shown as a structure or strategy rather than a policy. As for Israel, the same denial and unwillingness to face the unpleasant chapters of the past persists. Q: That assertion – that Israeli dispossession of Palestinians is an outcome of premeditated state strategy rather than a policy adapted to circumstances – contradicts the attractive notion of a fledgling state merely doing what it must to survive. It paints a far uglier picture. This is not an attempt to demonize the Israelis or Israel. My main argument is that the Zionist movement in Palestine until 1948 and the state of Israel are a settler colonial project that is still intact today. The nature of such a project is that the settlers in this particular case study see themselves as natives who return to their home and see the natives as aliens, who at best can be tolerated if they do not challenge to the settlers’ power and ownership. So this is not a matter of planning only or strategic clarity. Q: Settler colonialism seldom bodes well for the natives, and it certainly hasn’t for the Palestinian population now living in what you describe in the book as “the ultimate maximum security prison.” In “The Biggest Prison on Earth” you’re careful not to offer false or cheap hope for any good resolution to this problem – but do you see any such resolution as possible? To be honest not in the short run. However, I do believe that in the long run the basic features of the project will diminish and hopefully disappear. I am confident of a peaceful scenario: not in a big bang but in bottom-up evolution. Change will come first and foremost due to Palestinian steadfastness and popular resistance, the intensification of the international pressure on Israel, and it will be cemented by joint Palestinian and Jewish effort to reformulate the relationship between them on the basis of equality, democracy, and respect for human and civil rights. Joint life on equal footing is possible – the main obstacle is the state’s ideology that dehumanizes the Palestinians and refuses to allow them equal and normal life for the sake of what is deemed “Jewish Security” – namely an ethnic Jewish state that forever has a Jewish majority by all means possible and provides privileges and exclusivity for the Jewish people in it. This is an obsolete ideology and world view which will not hold water for too long in a world that wishes and struggles to ensure that more and more people would be liberated from tyranny, bigotism, religious fanaticism, and racism. When Marianne Schaefer Trench shot a documentary about Sheriff Joe Arpaio, her crew wanted to quit, and her audience thought they were watching a mockumentary. In 2001, I made a documentary film for German TV about the man who called himself “The Toughest Sheriff in America.” Ten years after I witnessed Joe Arpaio in action, a judge ordered him to stop detaining people based solely on racial profiling. Yet Arpaio continued to flout the law, and he faced up to six months in prison for criminal contempt of law. Before Arpaio was sentenced, President Trump pardoned him. When I proposed the Arpaio documentary to my German clients, they were skeptical. They had trouble believing that his kind of law-enforcement abuse was really happening, and, if so, they weren’t confident I would able to capture it on camera. In the end, my clients were intrigued enough, because deep in the German unconscious there is still the image of the U.S. as the Wild West, a place where the toughest guy with the fastest gun will determine what Law and Order means. Sheriff Joe represented the essence of the evil cliché Germans remember from these fictional old Westerns. In my film, Arpaio even compared himself to these old movies, saying if he would ever have to retire, he would not exactly vanish by riding into the sunset, but he would vanish because he wouldn’t know what to do with himself. There was no problem getting the man to cooperate. He craved the spotlight and behaved obnoxiously to satisfy the camera. Despite his cooperation, the filming became more difficult by the day because my crew developed such disgust and hatred for the man that I feared they would turn violent. We all started to feel dirty because we realized in some sick way we were feeding his oversized ego. Already back then Arpaio was in legal trouble. He had a website with a live feed showing people getting booked. The website came with a warning that one might witness violence or even sexually explicit content, which of course drew many viewers. Surveillance cameras also captured unruly detainees getting strapped into a chair and then tortured with stun guns. One inmate, Scott Norberg, died in the restraining chair. The Phoenix New Times compared the video material to watching a snuff film. Maricopa County and the sheriff’s office had to pay an $8.25 million settlement for the Norberg case alone. At least 60 people died in Arpaio’s county jail and many more got injured. Richard Post, a paraplegic, was pulled out of his wheelchair and cinched violently into a restraint chair, causing permanent damage to his neck and shoulders. At the time of my film project there were already hundreds of lawsuits against all of the sheriff’s divisions, and the department had amassed to a total of $14.7 million in settlements in the previous five years. Yet the majority of Maricopa County residents kept voting for Arpaio and supplied millions of dollars to his campaign efforts. He bragged about his prison tents because, in his opinion, detainees don’t deserve air conditioning during the scorching hot summer months or heat in the cold Arizona winters. His prisoners had to wear striped prison suits and pink underwear. In 2001, brunch was a new fad and Arpaio decided he should imitate the trend and cut down the three rotten daily prison meals to two. The women in the tent cities told me horrifying stories about the lack of medical attention. One woman in a tent claimed she had a miscarriage in her fifth month of pregnancy, without ever getting medical help. I witnessed the brutality of it all. Arpaio said he believed in equal rights for women, so women were also put into striped suits and chain gangs. I took my mutinous crew and accompanied the women to their workplace—an empty, windswept stretch of desert, the paupers’ graveyard. Their duty was to dig graves. As they were shoveling dirt onto a coffin, all the women cried. They told me they were afraid that one day they would end up just like this. One woman sobbed harder than the others. She told me she had buried her own father in one of these graves. Even spookier than Arpaio himself was his “posse”—thousands of deputies who were nothing but geezers with guns. This posse would become infamous during the Obama administration because they were all “birthers” and worked hard to prove the lie that the president was not a natural-born citizen of the United States. Maricopa County is the land of gated communities for retirees. Many of these old people told me they were bored with their daily golf or macramé classes, and that’s why they joined the “posse.” It was like a hobby to them. All they had to do was buy a gun, a uniform, and a car. Then Arpaio slapped a sheriff star on their chests and off they went, enforcing law and order. At the time I was filming, Arpaio’s posse was 3,600-people strong, and many of them seemed too old to even drive a car. Yet they patrolled the streets, frequently singling out Hispanics. When my film, The Toughest Sheriff in America, aired on German TV, so many Germans flooded Arpaio’s website to vent their outrage that the site crashed. The Frankfurter Allgemeine Zeitung, a major German newspaper, wrote: “Wherever he finds an audience he becomes the horse-mounted guardian for law and order, an image taken straight out of a tattered fictional children’s book or a movie. In his mind the golden dreamed-up past is still alive, and because he is the sheriff he has the power to turn it into reality.” Viewers wrote angry emails to the TV station, asking for more information on why and how this is allowed to keep going on in a First World country. Germans wanted to have Arpaio tried in The Hague, and they were convinced that his behavior was unconstitutional. Some even suspected that the film was staged, a fictional mockumentary about the U.S.
Arpaio was sheriff for 24 years before he was voted out of office last November. It wasn’t until July 31 of this year that he was finally convicted of a crime—and then only for a contempt-of-court misdemeanor, not for the vicious and deadly abuse of law-enforcement power. For the abuse, the racial discrimination, the killings and mistreatment of prisoners, Maricopa County was held responsible—never the sheriff himself. The county and its insurers had to pay the multimillion-dollar settlements. Most of the people whose rights Arpaio violated never sought justice in a court. It’s not surprising that Arpaio is Trump’s soul mate. In my mind, the real scandal is that I met this man 16 years ago and knew he was evil to the bone. Yet he stayed in office and was able to flout the law, the Constitution, and basic human rights for 24 years. And he doesn’t have to pay for any of it.